Bhadrabahu was born at Pundravardhan, now in Bangladesh. During his time, the secondary capital of the Mauryans was the city of Ujjain. While there Bhadrabahu was able to perceive through is nimitta jnan (subtle cognition of causes and effects) that there would occur a 12-year famine across North India. He decided the famine would make it harder for monks to survive as it would naturally make them a burden on a society already in need. He thus migrated with a group of monks to South India bringing with him Chandragupta, the aging founder of the Mauryan Empire turned Jain monk. While Bhadrabahu was away the remaining monks in the North realized that the sacred scriptures were being forgotten. A monk named Sthulabhadra convened a council to recompile the Purva scriptures. However, because Sthulabhadra’s own knowledge of these texts was imperfect, he wanted Bhadrabahu to study the sections missing from his memory. Bhadrabahu taught Sthulabhadra, but forbade him to teach the Purvaa to others upon witnessing a demonstration by Sthulabhadra of certain extra corporal powers, which indicated that with time these sacred scriptures would become corrupted. Thus, the 14 Purvas in their original form died with these two men. Bhadrabahu remains an exemplar of dedication to first principles at any cost. After him, the Sangha split into two separate teacher-student lineages of monks. Digambar monks belong to the lineage of Acharya Vishakha and Shvetambar monks follow the tradition of Sthulabhadra. Bhadrabahu composed some new texts as well. In the Shvetambar tradition, Brihatkalpa, Vyavahara, and Nisitha are considered his works. Among the most famous of all Jain acharyas, Kundkunda, the celebrated author of the four renowned books Samaya Sara (Treatise of the True Self), Pravachana Sara (Treatise of Lectures), Niyama Sara (Treatise on Pure Rules), Panchastikaya Sara (Treatise on Five Universal Components) and Ashta Pahuda (Eight Steps), which is a collection eight texts. All his works are written in a Jain dialect known as Shourseni Prakrit. The organization of Jain ideas into certain relationships and structures taken for granted in more recent centuries was ultimately a product of his genius. Such has been his fame since early items, that many other books actually written by his pupils and others are popularly ascribed to him. In the Digambar tradition he is named immediately after Lord Mahavira and the preceptor Indrabhuti Goutam in the Mangalacharana (auspicious blessing) prayer, and Jains of the Digambar tradition dub their tradition Kundakund-anvaya (the order of Kund kunda). However, scholars of all sects study his books with deep veneration. He was born around the beginning of the first century AD in South India in a place becoming a Jain monk was Padmanandi, but he is better known by the place of his origin. Kundkunda mentions that he was an intellectual descendant of Bhadrabahu I, the last Shrut Kevalin. Kundkunda belonged to an ancient order called the Nandi Sangha, wherein most monks assumed names ending in ‘nandi’. The Punyashrava Katha Kosh mentions that in his previous life, Kundkunda was a cow-herder who had found and preserved ancient texts and was blessed by a wandering monk. Acharya Kundkunda’s intense learning and moral character attracted royal disciples such as King Shivakumar. The story of Kundkunda is also surrounded buy legend- it is even said he could walk in air. Kundkunda’s influence extends far beyond Jainism. India has always been a land where philosophical debate is a standard feature of intellectual life. The concise and systematized aphorismic forms he brought to Jain literature and the literary structures in which he explained Jainism’s most advanced scientific principles relating to such area as atomic structure, cosmic dimensions, the cosmic ethers, and psychology, rivaled anything produced up to that time anywhere in the world. Hindu and Buddhist thinkers were put to the task of finding ways to respond to his explications of Jain philosophy and conduct, and he thus set unprecedented levels of erudition and rationalism in India’s overall philosophical discourse which would last through modern times. Out of enthusiastic respect, Acharya Kundkunda has been called “Light of this Dark Age”. Several commentaries on his Samaya Sara have been written in Sanskrit and modern languages. He was not an ordinary scholar; his great living works, Gomattasar Jivkand, Gomattasar Karmakand, Triloksar, Labdhisar and Kshapanasar are shining examples of his extraordinary erudition and a full justification of the title Siddhanta Chakravarty i.e. the great master of the fundamental principles. On the persuasion of King Chamund Rai, he wrote Gomattasar taking the essence of all available works of the great Acharyas. Jivkand and Karmakand are two parts thereof. The Shat Khandagam written by Bhutbali and Pushpadanta, the disciples of Acharya Dharsen, is the oldest work in the old traditional Jain literature. In the first part of this treatise many subjects from the soul and soul combined with karmas aspects have been described. Keeping these in view Siddhanta Chakravarty Nemichandra wrote Gomattasar and divided it in two parts, Jivkand and Karmakand. Gomattasar is a regular text-book of the Jain Vidyalayas. In the first chapter of this great work, Gunasthans have been elaborately dealt with. This lesson has been written keeping in view the deliberations there. For a wide knowledge of the Gunasthans, students are advised to study Gomattasar Jivkand. As very little is known even about the exact period of his life, it is but natural that one cannot precisely say when he entered the order of the saints by cutting asunder the ties that bound him to world. It is, however, suggested in the colophon given at the end Bhāshya that he composed great work dealing with almost every doctrine or dogma of the Jainas either explicitly expressed or implied in the city of Kusumapura (modern Patna in Bihar and Orissa), after he had renounced the world. He was a pupil of Śri Ghohanandi who was the grand disciple (Praśishya) of Śivaśrī the Vāchakamukhya. Umāsvāti too, has this appellation of Vāchaka added to his name. Even Mādhavāchārya the author of Sarvadarś-ana-sangraha, who calls him Umāsvāti Vāchakāchārya, corroborates this. There lived in Kathiawar a pious Jaina layman named Dvaipāyana. As he was proficient in the Jaina sacred literature, he desired to compile a great work, but his attempt was not being crowned with success owing to some worldly troubles. Therefore he took a vow not to take his meals until he had composed at least one Sūtra. He did not wait to practice his vow; so on that very day he composed the first Sūtra, selecting salvation as the subject of his work. In order that he might not forget it he transcribed it on a side of a pillar in his house. Next day he happened to go out on some business. In his absence a saint visited his house that was warmly received and entertained by his wife. By chance his eyes fell upon this Sūtra. He pondered over it and left the place after adding the word Samyag before it. When Dvaipāyana returned home he saw the aphorism so proverbially corrected and consequently questioned his wife, who suggested that the saint must have done this. He ran at once to find out the saint who had obliged him making such an invaluable and fundamental correction. On the outskirts of the city he came across an order of monks in the midst of whom he found the head of the order seated in the peaceful posture befitting him. He guessed that must be the very saint he had run after and so he fell at his feet and requested him to complete the work undertaken by him as it was far above his ordinary ability. The saint was moved by the compassion and entreaty, so he finished the work. This saint was no other than our revered author Umāsvāmi and the book completed Tattvārthādhigama Sūtra, it being an expansion of the various aspects, details and developments of the foremost, fundamental and all embracing Sūtra of Jainism. Acharya Shantisagariji was born on Ashad Krishna 6, V.S.1929 (1871 AD) in a digambar jain family at Belgul village in Belgaum District of South India. His father's name was Shri Bheem Goura and mother's name was Shrimati Satyavati (Satyabhama). His name was kept as Satgonda. Shri Satgonda was one of the five children in the family two elder brothers, two younger brothers and one sister. From the very childhood, he was reserved detached from homely affairs and took active part in religious celebrations & rites. He used to go to temple with his mother everyday. He was much interested in meditation and study of scriptures and used to wear simple clothes of Khadi. Mother always advised him and taught good things. The child Satgonda had extra- ordinary power of memory and many people knew it. The father gave him the virtues of being serious and determined. Satgonda was married at the age of only nine years with a girl of six years of age but ,the girl died within six months of marriage. He then declined for the second marriage and observed complete, clear and holy celibacy for the whole of his life. When he was intending to adopt Dixa, his parents allowed him to observe certain vows, rules and non-eating but directed that he should not leave the house until they were alive. He used to sit at the his parental shop and turned the shop as a self-study Centre for himself. At the age of 32, he went to the great pilgrimage of Smed Shikharji. On return from pilgrimage he took a vow of only one time dining in a day and not to eat ghee and edible oil for the whole of his life. His father also took water and meals only for once in a day for 16 years. When Satgonda was at the age of 37 his father accepted meditation-death and left the mortal body. His mother also passed away after three years by adopting meditation-death. Satgonda was now free from the bondages of parents. After few years Digambar Mooniraj Shri Devapa Swamy (Devendra Kirtiji Maharaj) came to Uttoor Village, Satgonda requested before him for Dixa. Under the guidanc of Gurudev Devapa Swamy, Shri Satgonda took dixa in 1915 AD at the age of 43 in Uttoor village and named ShantiSagar. He left everything after keeping only two clothes to wear and on begging bowl to ask for alms and to eat and accepted the whole earth as his own nature place. He, on his way of moving came to the mountain Girnar that was holy with the footprints of Tirthankar Neminath. At this place Shri ShantiSagarji Maharaj adopted Elak Dixa. Shantisagarji came over to Parnal village while moving, where the celebrations of Panch Kalyan Pratishtha Mahotsava of Lord Jinendra were going on. Digambar mendicant Shri Devendra Kirti Maharaj was also present there. 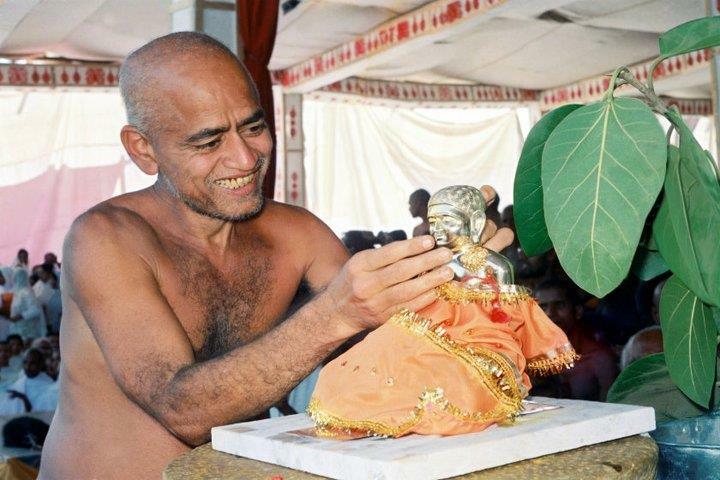 Shri ShantiSagarji requested for Nirgranth Dixa-Possessionless mendicantship by placing his head on his feet. Devendra Kirti Maharaj invested him with the title of Mooni ShantiSagar by granting him higher stage of Dixa. Now to observe the difficult vows, ShantiSagarji decided to go in forest and adopt meditation- death. While maintaining his vows very strictly, he moved towards the south and expanded religion at all places through which he passed. He advised people to shun evil practices. By time, he became famous. He granted Dixa and vows to several Shravaks.In 1834, he regularly established Shraman Sangh at the time of Mooni Dixa of Shri Nemisagarji. The Jain community gave him the title of Acharya at his age of 52 in 1951 at the holy celebrations of Panch Kalyanak Pratishtha Mahotsava at Gajpantha in Maharashtra. Acharya Shri ShantiSagarji was given further award of Charitra Chakravarti. Hundreds and thousands of ghee-lamps were being lighted at all villages and towns when AcharyaShri arrived with his followers and activities of high level discussions of scriptures, philosophical lectures and discourses, prayers, devotional songs and repetition of religious phrases were being undertaken. In 1928, AcharyaShri started for the pilgrimage of Samed Shikharji along with his disciples and followers. This was the first occasion after many centuries that a large group of mendicants were moving in north India. He was honored at all places and Panch. Kalyanak Celebrations were also held at SamedShikhar. Lacs of devotees arrived there for this celebration from the whole of India. Acharya walked about 35,000 miles in seven years and lacs of devotees had taken advantage of his spiritual knowledge. A large number of Acharyas, Moonis, small persons, women and celibates had taken Dixa at the hands of AcharyaShri. 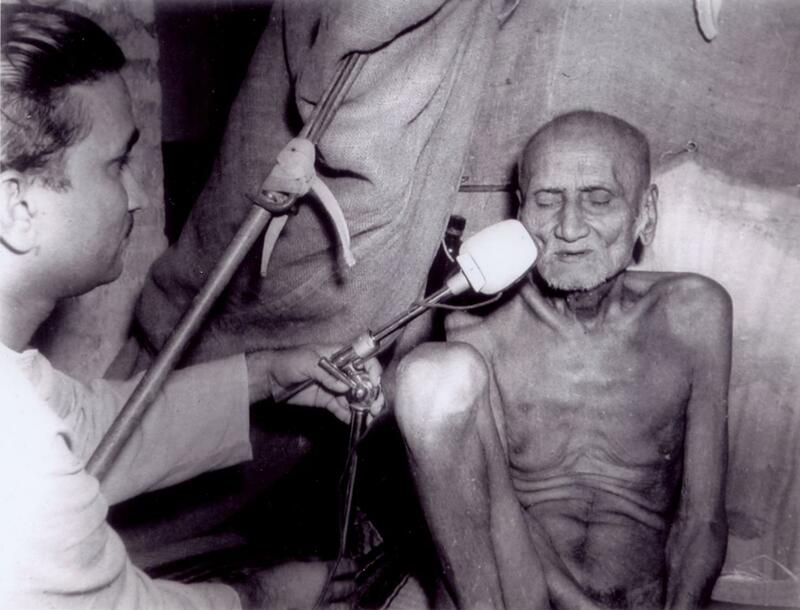 In 1955, in the month of August, Acharya Shri when he was 82 years, had a cataract in his eye and had become physically very weak. He was at Kunthalgiri in Maharashtra. It is a rule with Jain Munis to move from one place to another with proper care and vision. However, due to the cataract and weakness, it became difficult for Acharya Shri to observe this rule. 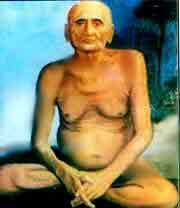 He therefore started feeling that his body was useless for the further spiritual enhancement (Sadhana). He resolved voluntarily to undertake a fast unto death (Sallekhana). On August 14, 1955 he gave up food. Slowly his body started getting weaker and weaker. However, his Soul (Atma) became firm in control in penance. In the first eight days, he took only two bits of food everyday. Then after he took only juice from black grapes for another eight days and after that he used to take water only. When he was absolutely weak and unable even to stand without help from someone, he adopted Yama- Sannllekhana and stopped taking water till the end of his life. He spiritually progressed significantly in complete detachment and unique renunciation. Jains and non-Jains in millions came for respect (Darshan). The President of India, Dr Rajendraprasad, Vice-President Dr Radhakrishnan and many learned people came to pay their respects to him and listen his sermons. Ultimately, on the thirty-fifth day of his fast, on September 18, 1955, he attained to death in a spirit of equanimity and in deep meditation (Samadhi). He had touched Jinendra Murti with his hand just before five minutes of his passing away and had moved his head towards his feet. He was muttering "Namah Siddhebhya: -"-respects to the Absolute when he breathed last. Acharya Vidya Sagarji Maharaj was born on 10th October 1946 in village Saslaga (Karnatka). He was digambar jain by cast. His Father's name was Shri Malappa Ashtge and mother's name was Srimati devi. He is a very learned man knows the languages - Hindi/ English/ Sanskrit/ Kenned/ Prakrat etc. 2.Acharya Vidya sagar sodh sansthan pisanhari madhia, Jabalpur. 3. Sri Varni Digamber Jain Gurukul , pisanhari Madhia Jabalpur. 4.Bharat varsiya ,Digamber Jain Administrative Training Institution. 5.Acharya Vidyasagar management Science Institution, Bhopal. 7.Gyanoday Viklang Punarvas Prashikhan and Sodh Sansthan. 10. Acharya Vidyasagar Scholarship Trust, Atishay Chhetra Mahuwa. Acharya Sri Vidya Sagarji has been a source of inspiration for religious functions. Several Panch kalyanak and Gajrath Mahotsava have been organized at different places of the country in the holy presence of Acharya Sri 108 Vidyasagar and his Sangh like Drongiri, chattarpur (M.P) , Bina baraha sagar (M.P), Morena(M.P), Madanganj kishanghar AjmerRaj, khajuralro kundalgri ,koniji , Jabalpur etc.